Dealing with a family member’s estate can be difficult, especially if you’ve also inherited a house. It seems like both the best and worst can come out of people when after a family member’s passing. Your siblings may want to buy you out . Sometimes you may be thinking of selling an inherited home but the thought of making house repairs can be overwhelming. I was the Administrator of my mother’s estate after my mother passed. I can relate to the stress and burden of being an Administrator. 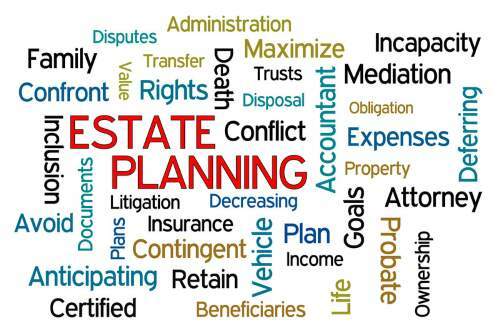 If you are the person who is now in charge of an inherited estate, there are a few things that you will want to start to take care of as quickly as you can. First, make sure the homeowners insurance policy is current and covers the current value of the property. Sometimes property values have changed since the insurance policy was put in place and you want to make sure the house is properly covered. Second, make sure mortgages, property taxes and bills are current. You don’t need to be surprised by a foreclosure notice or extra fees from late payments. You won’t be able to really talk to the vendors (or they won’t talk to you) until you have received your “Letters of Administration”. They’re not really letters, but a document from the probate court. This document states that you have been authorized to act on behalf of the estate. Most lenders and utilities will work with you once you have these letters from the court authorizing you as the Administrator or Executor. While you wait for these letters, you’ll still need to pay the bills and any mortgages. Third, if the home is vacant, consider a month to month security service. You want one that you can place in the house to protect it against vandalism, fire and water damage. There are several available, though I personally use Simplisafe. You’ll also want to determine the value of the home. There are lot’s of online options for estimating a home’s value. However, nothing beats having a set of eyes look at your property to determine it’s real value. Consider having a local real estate agent look at the property and give you a Comparative Market Analysis (CMA). This is especially important if you live out of the area and are unfamiliar with home values. The agent may be able to support a higher price than you think. But they may also tell you need to have a more realistic expectation because of needed repairs. However, don’t sign the listing agreement quite yet. If you are interested in selling your inherited house, you should also consider contacting a cash buyer. Cash buyers may actually be able to net you the same amount of money or more, especially if the house needs repairs. Realtors sell houses based on the value of their current condition, and charge your a commission. Cash buyers/investors buy houses based on what they will be worth after making all of the necessary repairs. They subtract the cost of the repairs and a small profit margin to determine what they’re willing to pay. There’s several misconceptions about selling to investors, but you should consider all of your options. If your inherited house needs repairs and you are looking to sell, we’d be happy to give you a written, no obligation, cash offer. While you are waiting for the probate process to complete, you will have several responsibilities relating to your inherited house. Initially, these may not seem too burdensome, but probates can take up to 18 months to complete, so you need to think about the long term. If you are planning on selling your house through a Realtor, it will need to be cleaned up and made ready for selling. This may require many weekends and trips, often times long trips out of town. Vacant houses continue to generate expenses – mortgages, property taxes and other bills all have to continue to be paid until the property is sold. This could require paying these expenses out of your pocket until reimbursed from the sale of the house. The costs for repairs and maintenance have to be paid while you are waiting for the house to sell. You can file a Creditor’s Claim with the court to be reimbursed for your expenses, but this takes time too. Assuming the house is vacant, you’ll want to schedule a lawn service company or be willing to mow the lawns yourself. You don’t need a code violation filed against the estate or attracting vandals. Do I have to wait for the probate process to finish to sell my inherited house? Probate can take several months, but I can usually buy your probate house very early in the process. Often this is within 30-45 days of your initial filing of your Probate Petition paperwork with the court. If you have questions about how the California probate process works there are several valuable resources online. If you would like to talk to us more about the possibility of purchasing a property you have inherited, call us at 916 542-2425.